This contemporary interior wall-light is not your traditional light fixture. The matt nickel fixture has an arm that swings out to give you a more personalised light. The direction the light faces can also be adjusted to meet your needs and comes complete with lamp. The matt nickel finish creates a contemporary atmosphere for any living room. The LED light gives off plenty of illumination to make your room comfortable. 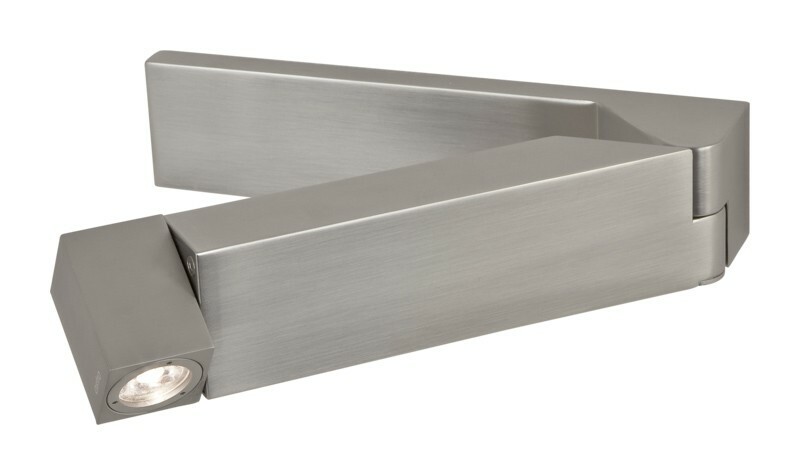 When not in use, the arm of the fixture can be closed so that it is neatly displayed as a small rectangular shaped fixture on your wall. We are pleased to currently offer free delivery on all orders within the UK mainland. UK non mainland includes the Scottish Highlands, Northern Ireland, Isles of Scilly, Orkney Islands, Inner Hebrides, Outer Hebrides, Isle of Man, Isle of Wight, Republic of Ireland (Southern Ireland), Channel Islands and Guernsey. Please contact us prior to placing your order to understand if a surcharge will be applicable. Failing which, any surcharges to outlying areas will be advised when your order is processed. All orders through First Choice Lighting are dispatched using a courier service and in stock items should be delivered within 2 - 4 working days unless otherwise advised. If you require a next day or urgent delivery please contact us as early as possible in order that we can notify you of the options available and surcharges applicable.